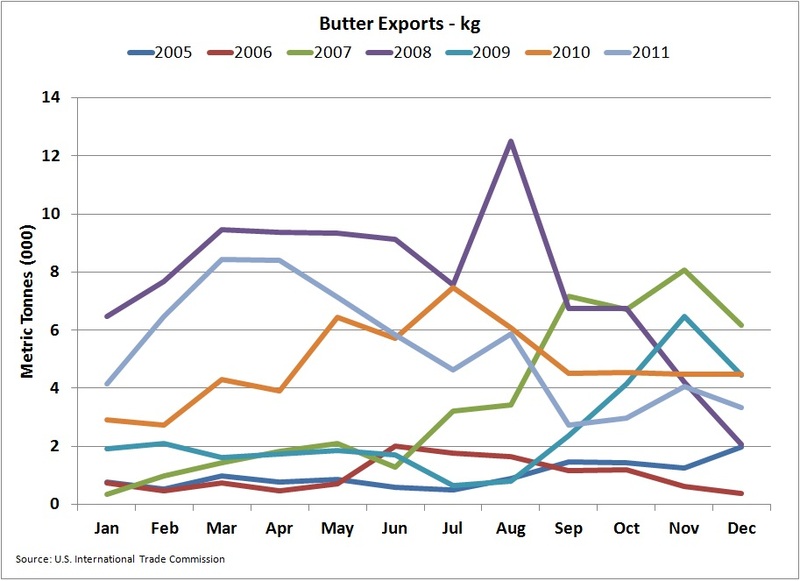 In the last blog post, a special edition of the 2011 dairy imports and exports was promised when the data became available. The import/export data is now available. 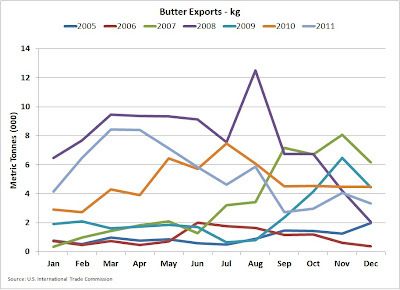 Dairy imports and exports are very volatile and had a major impact on milk price volatility in 2008/09. Consumer demand is relatively predictable. Imports and export, although much smaller than domestic consumption, have a significant impact because they are so volatile. What makes imports and export volatile? There are many things going on in the world that can influence the international market. A list would include; changes is global economies, emerging market developments, exchange rates, weather influences in dairy producing areas of the world, and international import and export controls imposed by countries. None of these factors are anything a dairy producer has any control over. 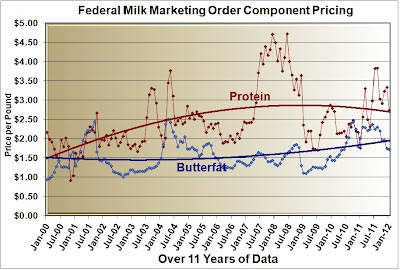 Nevertheless, they can have a huge impact on imports and exports which have a significant impact on U.S. milk prices. The U.S. Dairy Export Council does a great job of assisting dairy processors in finding export opportunities. By the numbers, 2011 was a terrific year. 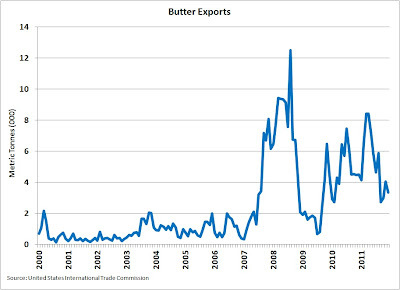 Dairy exports for 2011 were up 30% reaching a new high of $4.8 billion. Mexico remains our strongest export market with $1.1 billion or 23% of our total dairy exports. Exports to Mexico were up 41% in 2011. 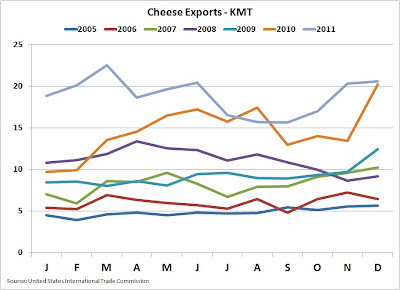 In 2011 we had a 70% increase in dairy exports to South Korea. South Korea is now our second biggest export market. Shown below is a pie chart of our most important dairy export influencing Class III milk pricing, cheese. 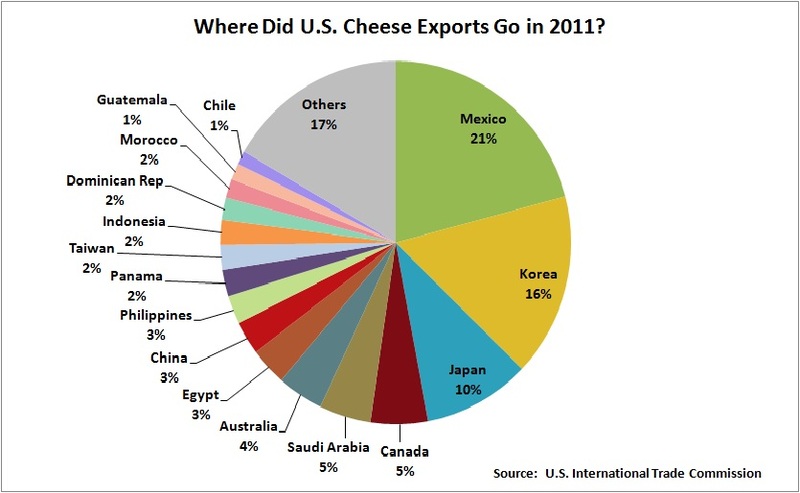 South Korean is a close second to our long time largest dairy export country, Mexico. 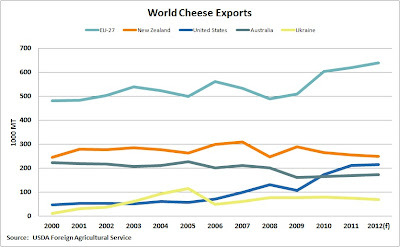 Over the last 10 years, the U.S. has shown a steady increase in cheese exports and is now the third largest exporter in the world, behind the combined countries of the EU and New Zealand. U.S. 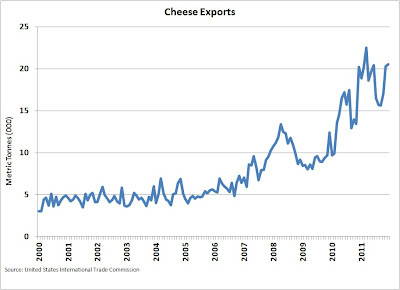 Cheese exports have quadrupled over a ten year period. 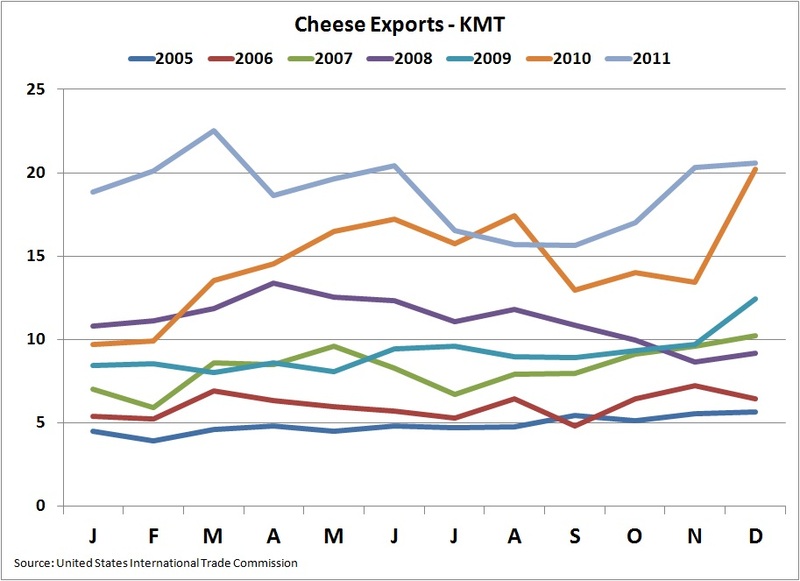 The chart above displays the very nice 5 year trend in increasing cheese exports. However, as we look at the chart below, we see that some of the great gains made in 2010, are slipping a little in 2011. The same analysis can be made for butter. Nearly 63 million metric tons were exported in 2011, up 12% from the prior year, but in December, 2011, exports were down 27% from the prior year. The nice gains made in 2010 could not be repeated in 2011. One of the most significant drivers of this volatility is exchange rates. 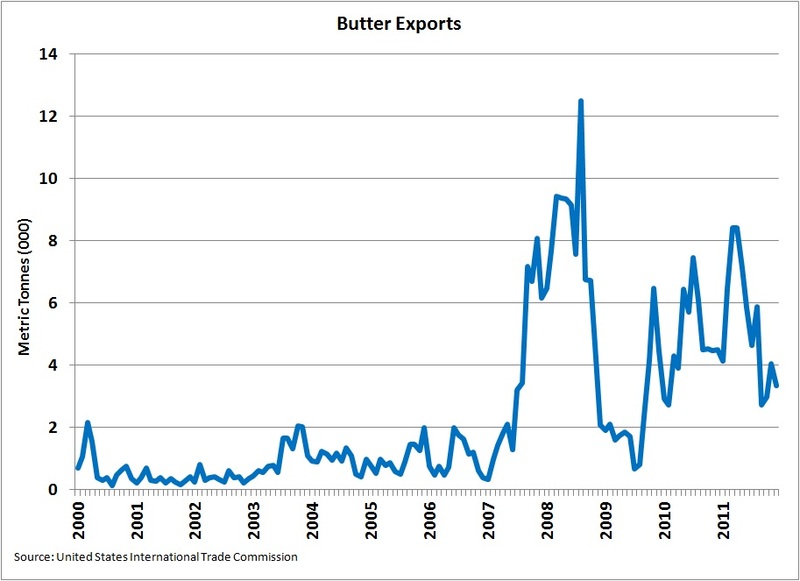 A weak USD makes our exports of dairy products less expensive. 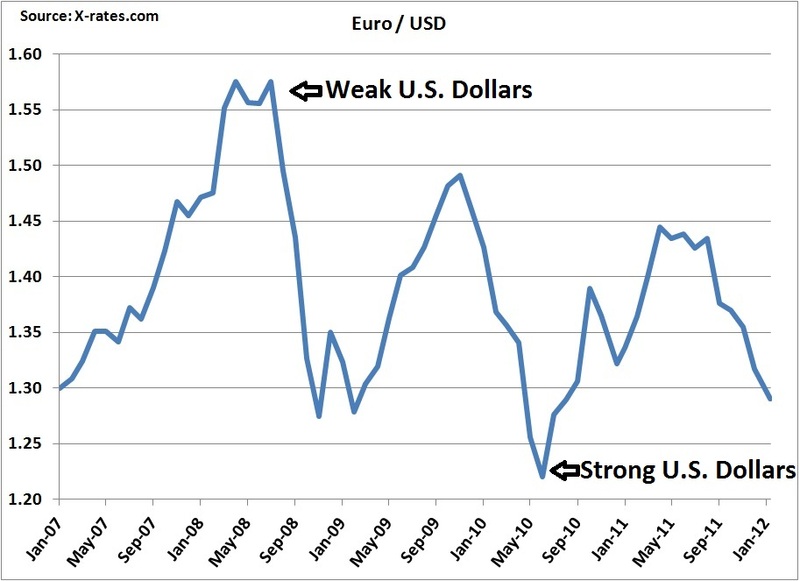 The most commonly tracked currency comparison is shown below, the Euro vs. the USD. 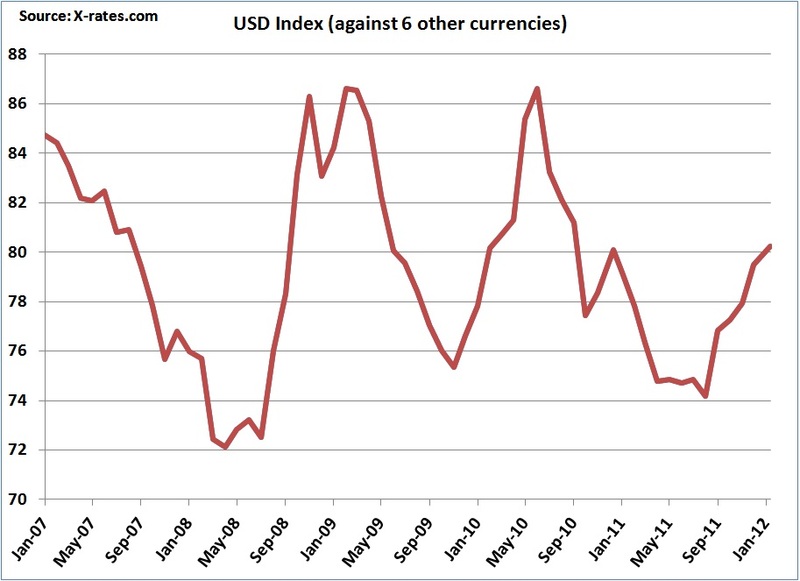 Note the growing strength of the USD throughout most of 2011. A more general comparison can be made with the USD Index. 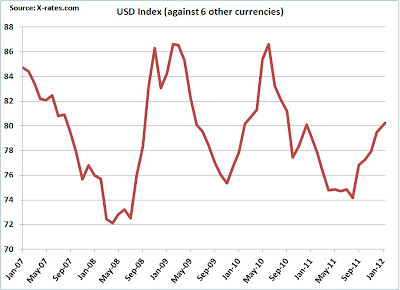 This index measures the strength of the USD against the six other currencies in the world that also freely fluctuate. 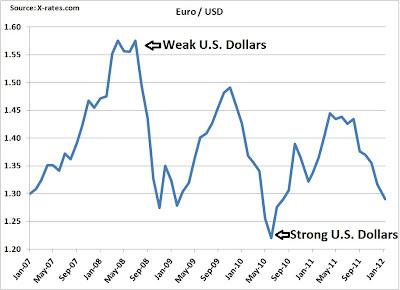 While this index is displayed with the inverse relationship to the Euro chart above, it is easy to identify the dominance of the Euro on this Index. 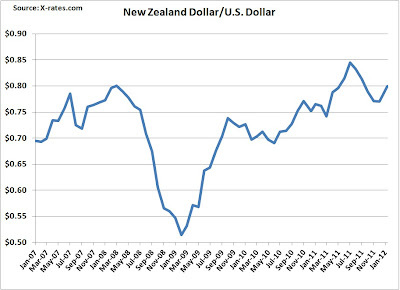 In 2008, when dairy exports skyrocketed and then plunged, changes in the New Zealand Dollar (NZD)were a big factor. Currently, the USD has remained weak compared to the NZD. The New Zealand dairy industry is very dependent on exports and therefore changes in the NZD/USD ratio can have significant influence on U.S. 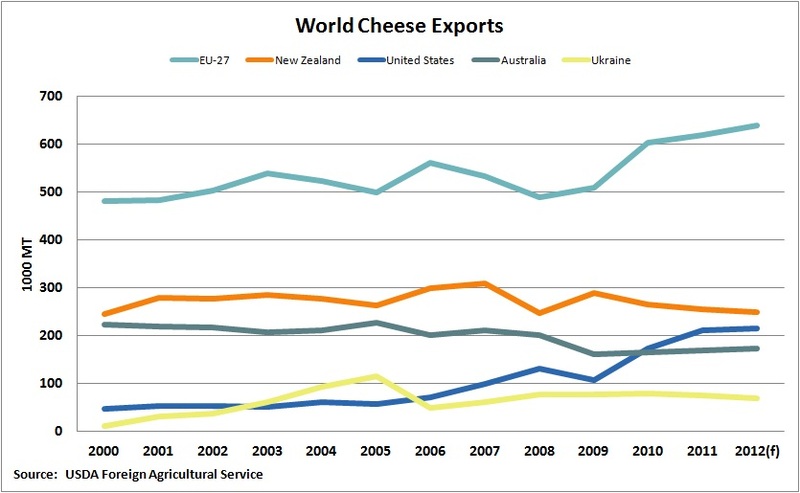 Dairy exports. 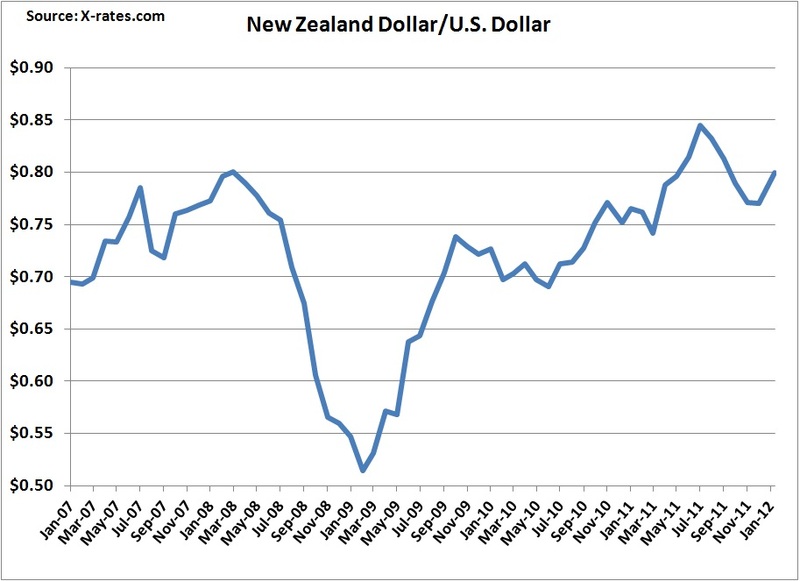 Currently, New Zealand does not have an exchange rate advantage like they did in 2009. 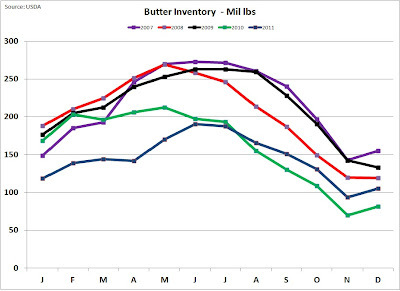 In the last post to this blog, cheese and butter inventories were reviewed. They both rose in December, 2011. Although new data is not available, this appears to be continuing as butter and cheese prices on the CME have fallen significantly. 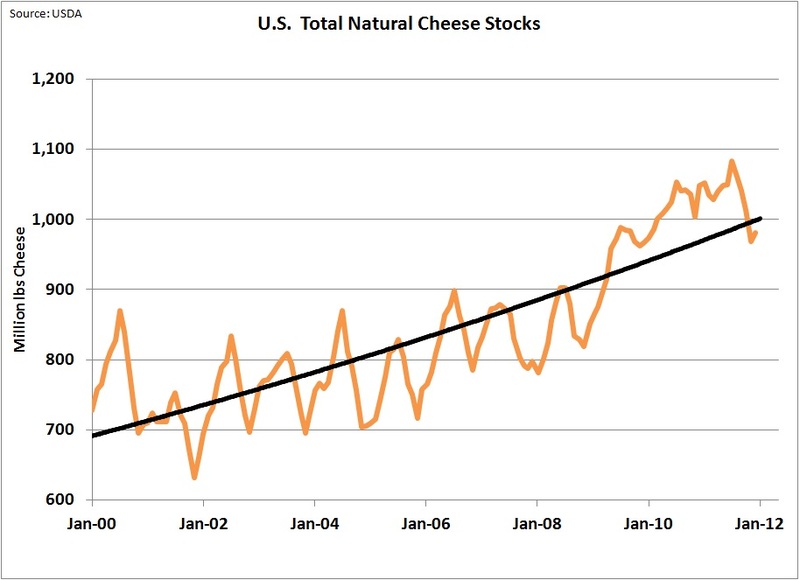 Apparently cheese production cannot change as rapidly as global market demand does. Cheese production in the U.S. reached new record highs in October, November, and December of 2011. Like it or not, the dairy business is now a global business. The U.S. must learn to live with volatility and must learn to be the low cost producer. In a future post to this blog, tools to hedge against price swings will be discussed. Tools like contracts, futures, and options are tools for risk management. Milk Prices Return to "Normal"
Class III milk and component prices were announced for January, 2012 on February 3. 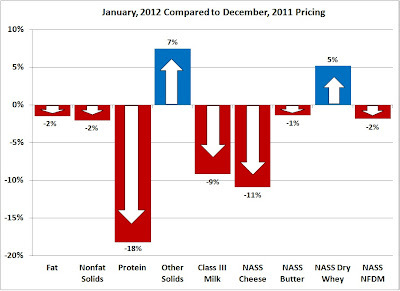 Butter and cheese prices fell to the $1.60/lb range during the month from their 2011 highs of over $2.00/lb. The changes can best be described as a return to "normal". 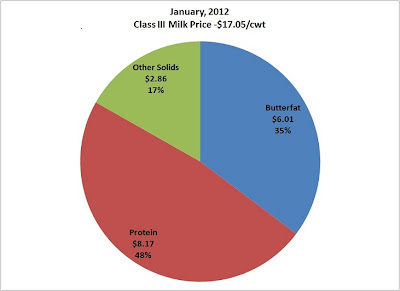 Class III milk prices were $17.05/cwt with butterfat at $1.72/lb and milk protein at $2.73/lb. Compared to the prior month, the dashboard shows mostly red. 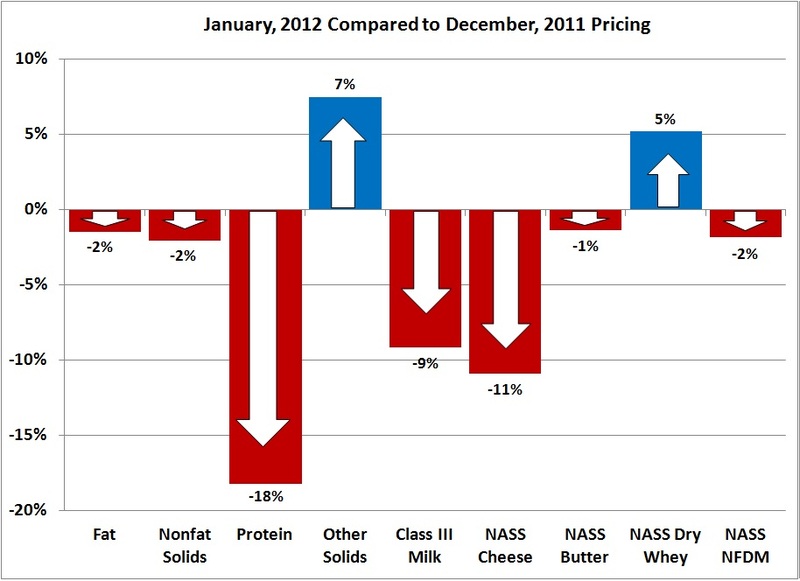 But compared to the long term trends, January prices were "normal". 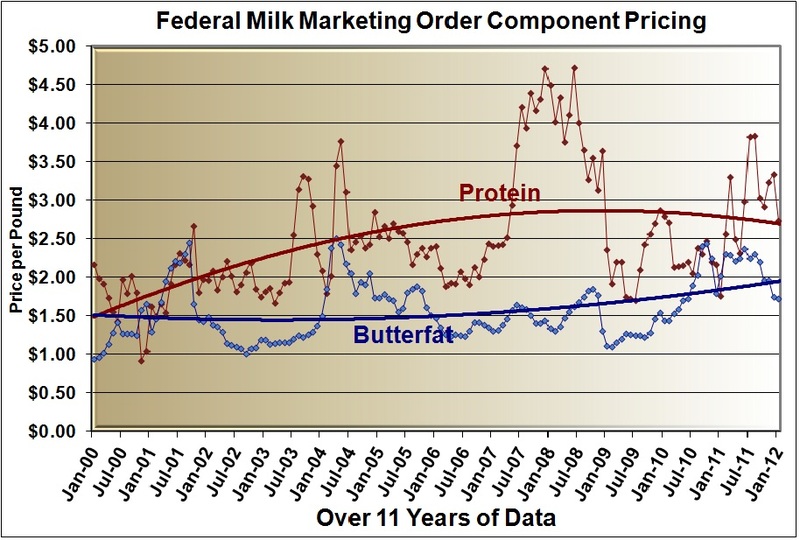 Protein continues to dominate the value of milk, with "other solids" taking on an unusual significance. The most significant input parameters for calculating milk prices, cheese, and butter prices, fell to $1.61/lb and $1.59/lb respectively. What brought these changes about? 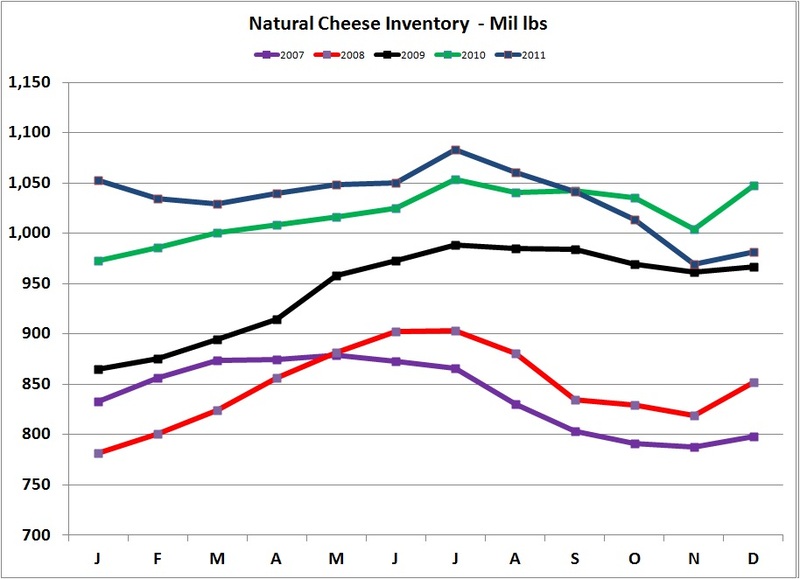 Primarily inventory changes - with butter (which has been very low) returning to more normal levels and cheese (which has been slightly high) also returning to more normal levels. One of the significant factors driving these changes has been exports. The final export/import figures for 2011 will be available in a few weeks, and a special post reviewing these will be made at that time. Because exchange rates play a major role in the international forces that impact imports and exports, they will also be reviewed in this upcoming post. 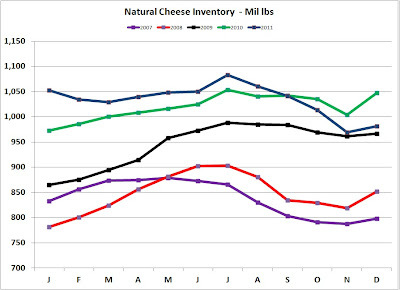 The remainder of this post will be spent examining the parameters dealing with the supply side for the most important element in milk pricing, cheddar cheese prices. 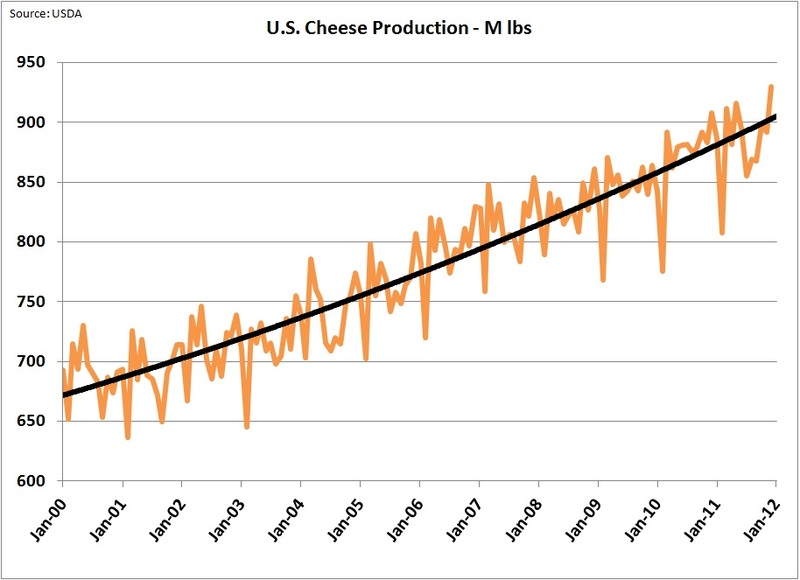 Cheese per capita consumption has been increasing steadily for decades, so one would not expect cheese production or inventories to remain static as they must grow with the increases in consumption. However, production growth not consistent with the growth in U.S. consumption (and exports) will lead to abnormal inventory levels. 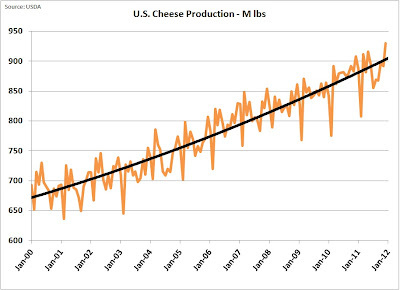 Cheese production over the last 11 years has grown in a rather predictable pattern. But as we look more closely at the last few years, abnormal production levels can be seen. 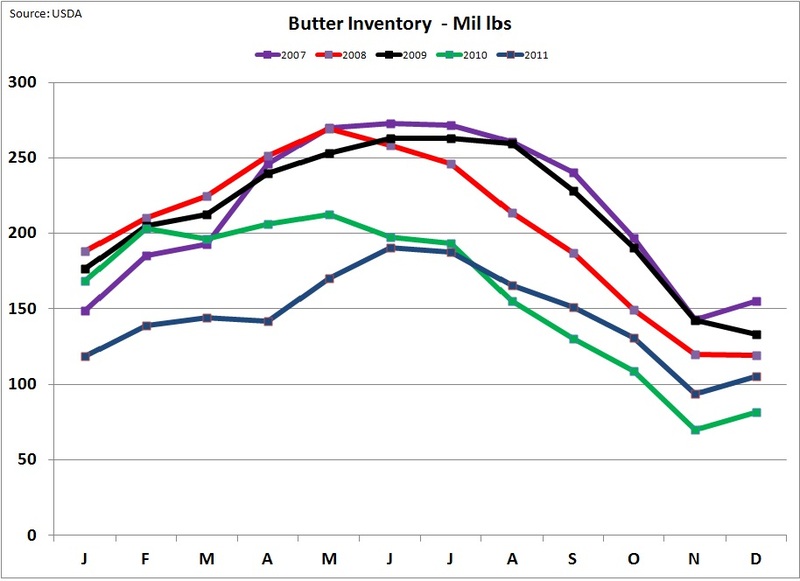 Unusually high production occurred in 2010 (when milk prices were low), and unusually low production occurred in 2011 which brought inventories back to more normal levels. 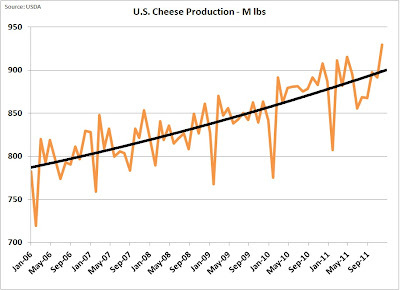 This in turn led to some unusual "blips" in cheese inventories, with inventories rising higher than normal in 2010 and early 2011, followed by a return to more normal levels by the end of 2011. 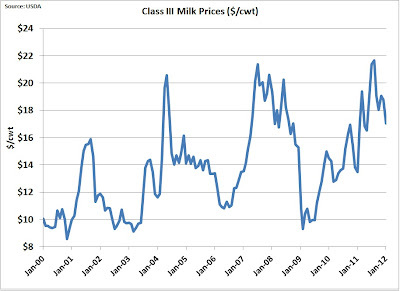 The low Class III milk prices which began in 2009 and continued in 2010 can be seen in the chart below. 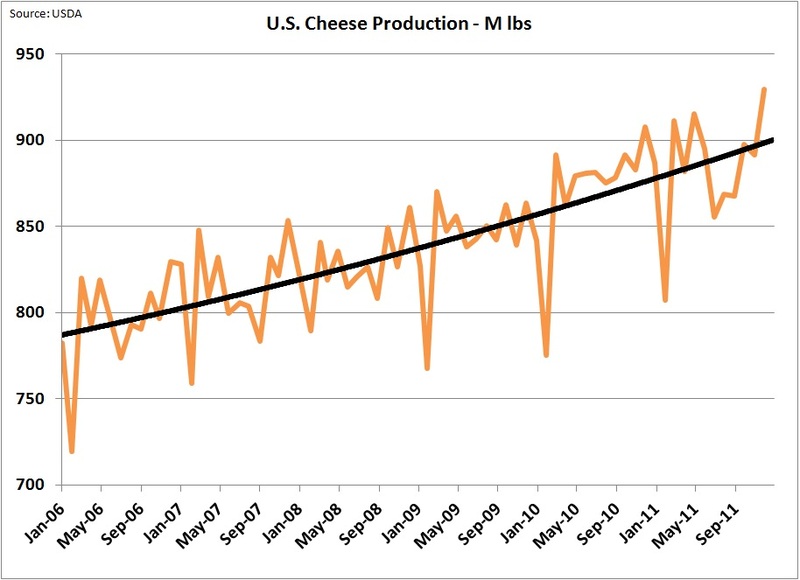 The view presented above deals only with the supply side of cheese production and it's impact on inventories. That is only part of the picture. Demand side changes are also very important. 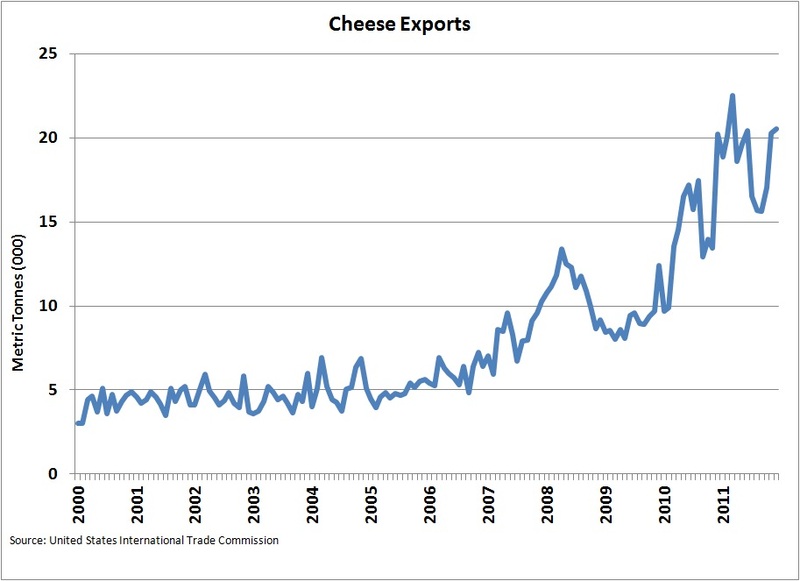 While U.S. consumption is pretty predictable, exports are becoming an increasingly important part of cheese demand and they can be very volatile. As the full data for 2011 becomes available in the next few weeks, exports will be reviewed with a special post in the blog.